The beach is my happy place. I am always game for waking up with no worries, rushing out to the sand and watch the waves come in or swimming backstrokes in a gorgeous pool gazing up at the palm trees. We were pretty excited to visit Hilton Head again this summer and make some great memories together. 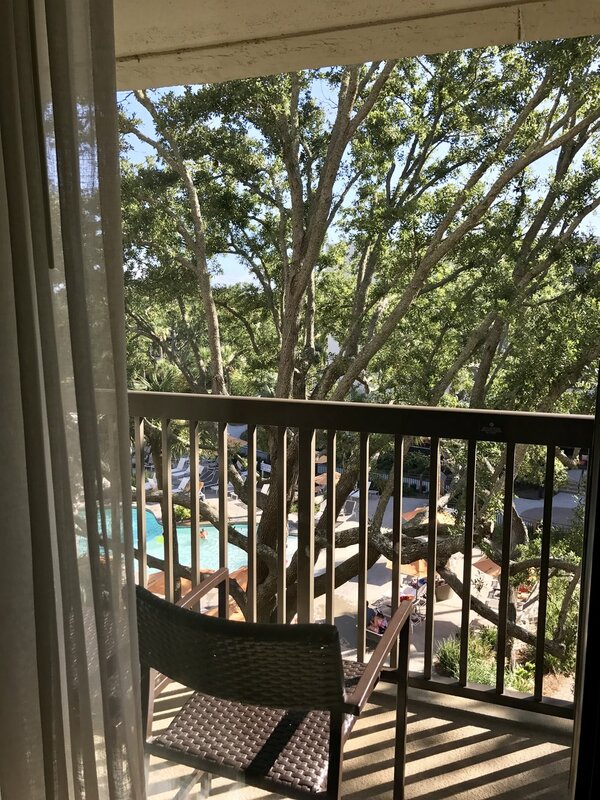 We stayed at Sonesta Resort Hilton Head Island and it was pretty incredible. A while back I posted on Instagram about surprising Harper with a trip to the beach. I loaded up the car full of our suitcases, favorite snacks, beach chairs and lots of sunscreen. She had no idea. We drove home like usual and then I surprised her! Harp was excited!! It took her a while to process that we were actually leaving at that moment. She kept saying, "but I need my bathing suit" haha! We had that and about everything else in the house packed and ready to GO! After driving 6 hours, we made it. Stepped foot out of the car to one gorgeous hotel! When we got to the room there were two large beach bags full of the cutest gifts. Homemade chocolates shaped like alligators & flip flops. We got hot pink & bright blue towels with lots of cookies and sand toys. That was pretty amazing. Not to mention a huge fruit and cheese tray! We went straight for that and the cookies and milk. So let the adventure begin, with feeding our faces. The room was beautiful and we loved having two queen beds. Harp would bounce back and forth, wishing she could sleep in both at the same time haha!! The bathroom was insane, with a large tub and glass shower! It was a little piece of heaven!! The way to my heart is foooood! We are big foodies but can appreciate good junk food when we see it too! The breakfast at the hotel was amazing. We ate a lot at Hewards Restaurant and Seacrest Restaurant inside the hotel. I am talking they had a smorgasbord of build your own homemade waffles, omlettes, bagels (insert heart eyes), an entire fruit bar and so much more! Harper looked forward to decorating her waffles every morning. I think her favorite was the a tower of whip cream and a single chocolate chip on top. I loved the bagels and omelettes. Bailey's Bar & Terrace is really cool too. It transforms throughout the day and is recognized as the heart of the hotel. You can get a quick morning coffee, treats and then cocktails in the evening! This is Harper posing with her virgin strawberry daiquiri! lol diva! To the right, me and my brother, Sam! We spent time with our family while we were here and our sweet neighbors!! It was the best!! getting our nails done at the spa! Arum Spa is gorgeous! They are upstairs in the hotel room and it's like a little oasis. It is calming and the music almost put me to sleep walking in! I can't even imagine with a massage too! We loved getting our nails done together. That is one of our favorite things to do together, aside from painting pictures. We got mani's & pedi's! Harper was so proud of her blue nails and wanted to show everyone! feeding the turtles! shut the front door! We got to feed a ton of turtles. There were a lot of children around, so I didn't get a good picture of the turtles but they were everywhere. It was a lot of fun. Literally, you just walk out of the hotel to the large pond and just start feeding them. I love how the resort was super kid friendly, with dive in movies at the pool, turtles and they even had a place set up for kids to get floats and anything else you might need. buying a bunch of jewelry at the gift shop! Harper picked out a ton of handmade layered bracelets. She loved them and stacked them all up her arm! My little diva. The gift shop is called Pearl's Market and it is super cute, full of breezy apparel, outdoor and sport accessories. They have a lot of island inspired gifts, toys, gourmet foods and snacks. They can even pack up goodies and send them right to your room! I love love that idea!! lunch & dinner at the sandbar! The pool was amazing and we spent a lot of our time here! Harper just loved it!! Mama loved the drinks too! Mudsliiiide! The beach was perfect! We had the best weather and enjoyed just being together. Harper found so many seashells and looked forward to the times I said yes to snow cones. No joke, that girl could live off of them. It was pretty funny how her entire mouth was purple most of the day! The staff were super nice and the hotel was immaculate. They kept it really clean. There's nothing like taking a hot shower after a long day at the beach and passing out in the softest fresh sheets! ahhh music to my ears. We practiced not doing anything. It was hard at first but after day two we were pros! We still think about all the awesome memories had here! It was such a blessing and we look forward to visiting again soon. Thank you for stopping by friends! Leave a comment of your fav memory at Hilton Head Island if you've visited before!! Thank you to Sonesta Hilton Head Island for being so good to us. We will hopefully make it in the November to see all your Christmas trees!